Things have not gone to plan with my children’s knitting class so I’m backing off until the new year when I can regroup and start fresh. The Knitty Keen website is up and running, you can check it out here. Drop me a line and tell me what you think. Knitting is happening, albeit slowly. I’m doing Nakniswemo with a Flax for Thing 2. I have 3″ of body left, then the ribbing, and off to sleeve country. I’m thinking of doing the sleeves 2 at a time but I don’t know if that will make them go faster or slower since I’ve never done it before. At the beginning of the month, I bragged that I was going to do 2 sweaters for Nakniswemo, but now I’ll be lucky to finish one. Between last night and today I finished the first repeat of A Walk Through Aspens in mal Rios from a very generous swap partner. 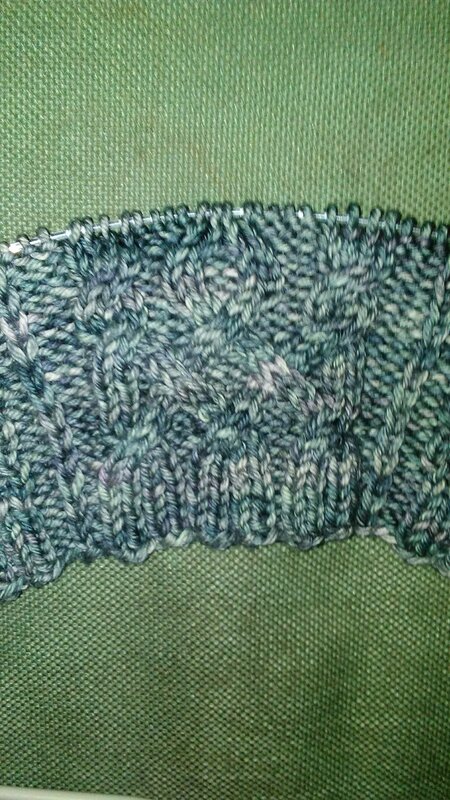 It’s fun doing cables, especially since they are only 2 and 4 stitch ones so I don’t have to use a cable needle. I still have another sweater to finish, so I won’t be playing with this one too much. In case you didn’t know, I’m on Instagram now as knittykeen, so check it out for lots of WIP pics. This is about all the time I have right now, but I promise you”‘ll be getting a finished object post soon. TTFN! With the new business, I’m expanding into more social media outlets. I’m actually using my Twitter account (@Knittykeen) and I just signed up for Instagram (knittykeen although I don’t know how to access it to post a link). The Times, they are a changin’. The Etsy shop is stocked with snowmen ornaments and patterns – use this link – https://www.etsy.com/shop/knittykeen?coupon=LETITSNOW for a 15% coupon. Kits and more to come! In other knitting news, I finally finished off a pair of Gryffindor scarves for my cousin’s daughter and granddaughter. Written pattern soon to come. I’m currently working on a Flax sweater by Tin Can Knits for my youngest and several more this season. I have a lot of work that needs doing to get into full swing. Knitty Keen business stuff is going well, it’s trying to keep track of it all that’s hard. With any luck, I’ll have all my licenses and numbers by this time next week and then I can really get to work. That’s about all the time I have – TTFN!